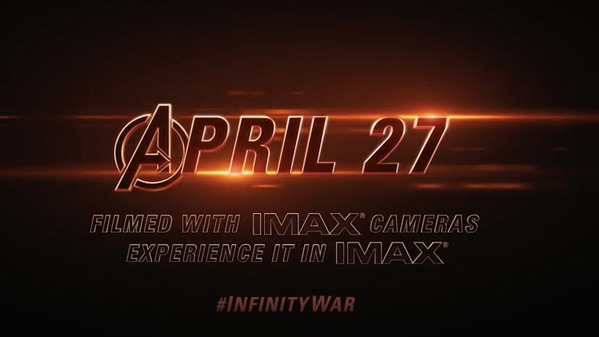 "See up to 26% more in IMAX!" Well, this is pretty cool. IMAX has released their own version of the latest trailer for Marvel's Avengers: Infinity War, and it's a full side-by-side comparison of every shot in the movie. The reason they're promoting this - because this entire movie was filmed with IMAX cameras, one of the first to do this (Christopher Nolan has come close in the past, but this is entirely IMAX from start to finish). The trailer features the exact same footage from the most recent full trailer, but really emphasizes just how much more of each scene you'll see in this. There aren't a lot of moments where characters are cut off in the original size, but it definitely makes a strong sell for IMAX. Thanos looks bigger and badder than ever, and even Hulk looks larger. We recommend getting your tickets ASAP for full IMAX screenings of this.